Redmi Note 3 is one of best selling phone of Xiaomi mobile and most the Xiaomi fans are using the same as their primary phone. If you are one of them and tired of waiting for the official Marshmallow update for the Redmi Note 3? Here is the guide which you can follow on your update Redmi Note 3 with Cyanogenmod 13 Marshmallow. No, this one is not the official update this one is the one of the most famous Custom ROM and based on the latest Android Marshmallow. With this ROM you can enjoy all the feature of Marshmallow on your Xiaomi Redmi Note 3. Today, in the below mention tutorial we’re going to show you how to update the device to Marshmallow manually thanks to the CyanogenMod 13 custom ROM. The guide is only for the Redmi Note 3 user and don’t try this method on any other Xiaomi devices otherwise you will brick your phone. Do take the backup your device and save it on your PC or some safe place. This procedure is only applicable to the Snapdragon version of the Redmi Note 3. Please don’t proceed if you have the Mediatek version. a) Redmi Note 3 Smartphone with unlocked bootloader and TWRP installed. 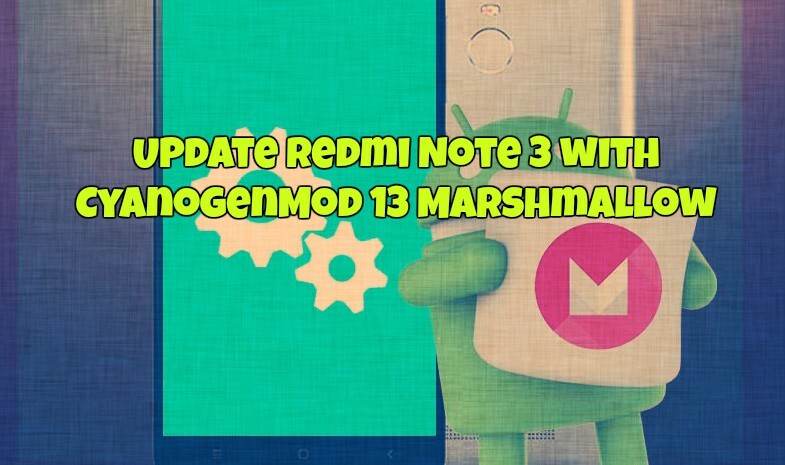 b) Cyanogenmod 13 Marshmallow ROM for Redmi Note 3. Download Here. c) GApps zip package to install all the Google application on the Phone. Download Here. Step 1. Download the Cyanogenmod 13 Marshmallow ROM and Gapps zip file from the above mention links. Step 2. Once downloaded. Now connect your device to the computer and copy both files to the root of your device’s internal storage. Sep 3. Now all you have to do is boot your Phone in TWRP recovery mode and flash both the file. Step 4. Boot your Phone in recovery mode. To do this, first, switch off your device and wait for 5 seconds. Next, hold the Volume Up + Power buttons until your device boots into TWRP recovery. Step 5. Now you will see the TWRP recovery screen on your phone. Here Tap on Wipe and then Swipe to Wipe Data/Factory Reset. Step 6. Now tap on Install and then select the Cyanogenmod 13 Marshmallow ROM ZIP file. Tap on the Add more Zips button and choose the Gapps file. Swipe to confirm the flash. Step 7. Now the flashing process will start on your phone, and it will take some to make some changes on your phone. Step 8. Once done, go back to the main menu of recovery and Select Reboot System. Your tips for rooting Xiaomi Redmi Note 3 and installing CyanogenMod Marshmallow ROM is very helpful. I am using Asus Android Tablet Model k004 me371 with Android 4.1.2 OS. Is it possible to root and install CyanogenMod Marshmallow ROM on this phone? Request the procedures for rooting and installing CyanogenMod Marshmallow ROM on this phone. My sim 1 slot is not working.Please find a solution to it.